Visual marketing is not a term as commonly used as SEO, link building, or content marketing, but it always plays an important part because images and videos get more engagement. True, high-quality text content you can get from Online Essays Scholaradvisor, but your visual content just puts you over the bar. In social networks such as Instagram especially, it is all about visual marketing because the content is all visual. If you have an online business that fits the profile for an Instagram campaign, you are definitely going to benefit from having one. The question is, how do you measure the return on your investment? You need data. You have to know if your Instagram posts are getting the attention you need for your business to increase its authority and visibility, or you may as well not do it. Fortunately, getting the data you need is easier than you might think. 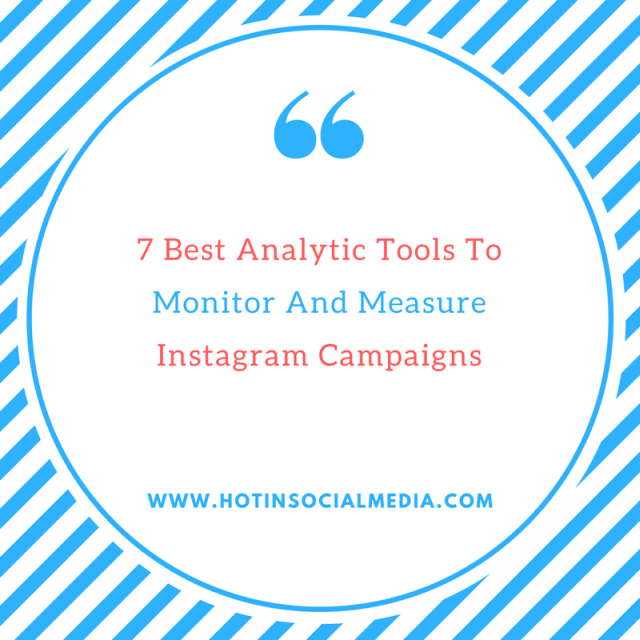 You just need to use the right analytic tools not only to monitor your Instagram campaigns but to measure their effectiveness. Here are 7 of the best analytic tools to monitor and measure Instagram campaigns. Curalate is actually a multi-channel visual commerce platform, which includes features from content scheduling to shoppable galleries. In terms of analytics, however, you need to look at Visual Insights into how these other features are affecting your Instagram campaign. This tool can measure not only likes and shares of your visual content, but how it generates clicks, conversions, and revenue. For example, when you integrate Curalate’s Like2Buy or Image Recognition feature in your Instagram images, you will find out what types of images actually lead viewers from Instagram to the site. All that convenience and analytic power in one service come at a hefty price. The average cost for using Curalate is between $1,000 and $2,000 a month. If your business volume can handle it, however, Curalate is one of the best tools for your Instagram campaign. You can breathe a sigh of relief if you want to measure your impact on Instagram, but don’t have the money for a paid service. Union Metrics is actually a paid analytics tool that starts from $99 a month, but it does have a free tool specifically for Instagram analytics. It can identify the best time to post, hashtags that get more engagement, type of posts that work, and your top fans. If that works for you, then go for it! If you need more information, then you do need the paid service. A paid account will provide you with a historical analysis, track monitor hashtags, identify influencers, and search keywords. If you have an ongoing contest or brand awareness campaign on Instagram, and you want to track and measure the performance of your hashtags, then you can use this tool. It may sound simplistic, but hashtags are very important for engagement on Instagram, so measuring its impact is central to any individual Instagram campaign. With full access, you can also compare its performance across different platforms, including Twitter, Vine, and Tumblr. You can put in one hashtag to try it free, but it is very limited. You can try the full features for free for three days, after which you need to pay from $24.99 a month. You can download these reports and keep them for reference for campaigns you may launch in the future. The social media monitoring and analytics tool of Simply Measured is perhaps one of the most comprehensive out on the market. It doesn’t really do much more than measure and monitor campaigns on all types of social media including mainly visual ones such as Instagram, YouTube, Tumblr, Vine, and Pinterest, but also Facebook, Twitter, Google+, and LinkedIn. However, what it does, it does very thoroughly. It’s not surprising that the paid service is a bit on the high side (from $500 a month), but it does offer a pretty good free user report for Instagram, which includes detailed analytics for one account. If you have just the one account, that’s a good deal. It is unlikely you only need to analyze Instagram accounts for your business, but in case that’s true, Iconosquare is a great tool for you. The most basic plan will give you a daily report delivered to your designated email on the overview of your Instagram interaction, community insights, historical view of your posts, and audience engagement. It is easy to set up, and the dashboard is very user-friendly for non-techies. Iconosquare no longer offers a free plan, but it does offer a paid plan at $9 a month per Instagram account. If you have just the one account, then this is almost as good as free. However, if you want more features such as hashtag monitoring, your bill goes up from $29 a month per IG account. This is a popular tool you should consider for our Instagram analytics. You get detailed daily reports on your Instagram activities including followers, post history, most popular and engaged hashtags, and engagements. You will find this analytics under Reports in your dashboard. There is no free plan, but you can try any of the plans free for 30 days. Paid plans start from $59 a month (deluxe version) for all the standard features including a social inbox. Last, but perhaps the best analytics out there specifically for Instagram is its built-in and free (with a business Instagram account) tool. If you’re thinking it is weirdly like Facebook Insight, then you would be right. Remember that Instagram was acquired by Facebook in 2012, so it stands to reason that what works for Facebook should work with Instagram. Since it’s a free mobile app, and not only provides in-depth follower demographic analytics but also “actionable information about who their followers are and which posts resonate better than others,” it is definitely a great tool to use.